Can I combine wedding suite designs? Yes. Through our free designer assistance service, we can help you combine different aspects of two different wedding suite designs together. For instance, perhaps you like the artwork from one suite design but you like the type layout from another design. We can assist you in merging those aspects together. Please kindly note, we cannot combine our foil designs. If you happen to like a non-foil design motif or element in a foil design, we can combine those parts. Find the card that has either a foil design like you or has the typography that you like. Click on "Personalize" and personalize the card as much as you can on our website. On the Approvals page, select "free designer assistance" and type in your request. 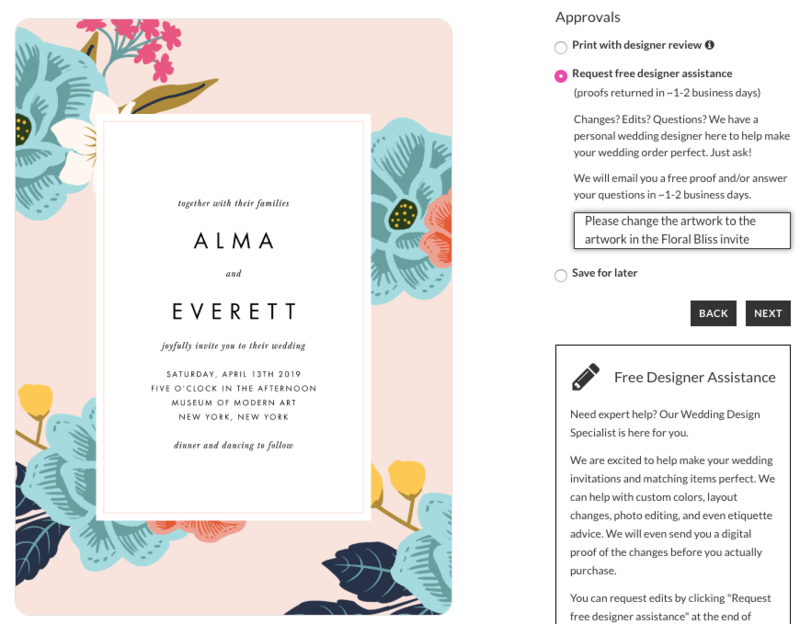 In addition to any other requests you have, here is where you mention the other wedding design and what aspect you want transferred to this proof you're working on. Once you have submitted the request, you can leave the card you worked on in your shopping cart. Our designers will send you a revised proof within 1-2 business days with the changes you requested. From there, you can request even more changes or approve the proof.